Accra, Jan. 27, GNA - The private life of Dr Richard Anane, the President's nominee for Minister of Road Transport came under the spotlight when he appeared before the Appointments Committee to answer questions on allegations of corruption, "womanising" and poor performance. Dr Anane, married since 1982, told the Committee that he had had an affair with an American lady with whom he had a child and said it was "regrettable" and an act of indiscretion. The nominee, who had to give details of his private life with the lady, told the Committee that it was untrue that he had transferred some 90,000 dollars to the lady during their relationship. Mr Bagbin, Minority Leader in Parliament and a member of the Committee took time to explain to the nominee that as a Minister of State, what he did in private was of importance to the nation. Asked if he was taking care of the baby boy he had with the American lady, Dr Anane said it was his duty to do so and besides his wife had taken the trouble to take up some responsibilities on behalf of the child. Responding to alleged corruption on his part involving the running of some private companies, Dr Anane said: "such comments do not attract my attention." "I see them as unmeritorious. So I do not respond to these allegations of corruption." On Ghana Airways, the nominee said when the NPP administration took over in 2001, the total debt of the Airline stood at 130 million dollars with the organisation losing about one million dollars monthly. He said what they did was to "stop the bleeding" to resuscitate the dying airline. On steps to be taken to pay workers of the Airline their severance awards now that the organisation was going to a new group, the nominee said a body had been set up to handle the issue and that negotiations were going on with the staff to arrive at an amicable settlement. 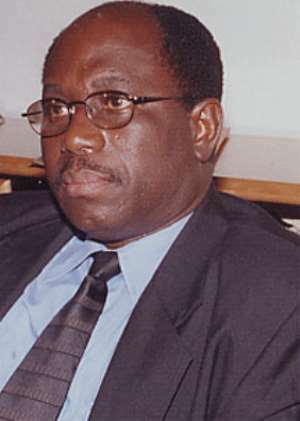 Dr Anane said currently the total debt of Ghana Airways stood at 162 million dollars. On the road sector, he said the construction of roads had suffered over the years because of the capital-intensive nature of road construction. Dr Anane said the focus of the government was to increase accessibility throughout the country to facilitate socio-economic development.